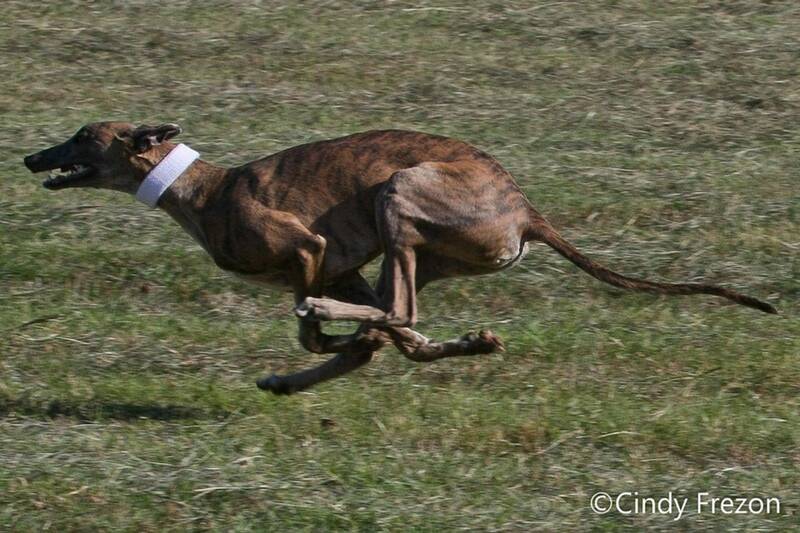 Lure coursing is similar to hare coursing, minus the rabbit. A lure (usually a white plastic bag on a string) is pulled through a series of pulleys, by a motor, controlled by a lure operator. 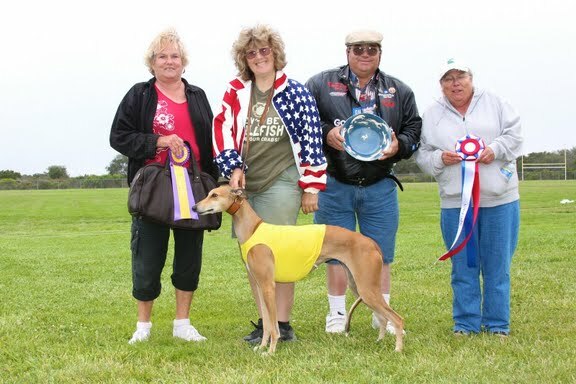 Courses vary from short, straight courses offered by the Large Gazehound Racing Association (LGRA), to the slightly longer oval courses offered by the National Oval Track Racing Association (NOTRA), to the elaborate pulley systems and extremely long courses that mimic the way a rabbit would run in the field offered by the American Sighthound Field Association (ASFA) and the American Kennel Club (AKC) lure coursing. The LGRA and NOTRA events are actually considered amateur racing events instead of lure coursing, but since it is all fun for the dog and the events are held in our area I am including them too. 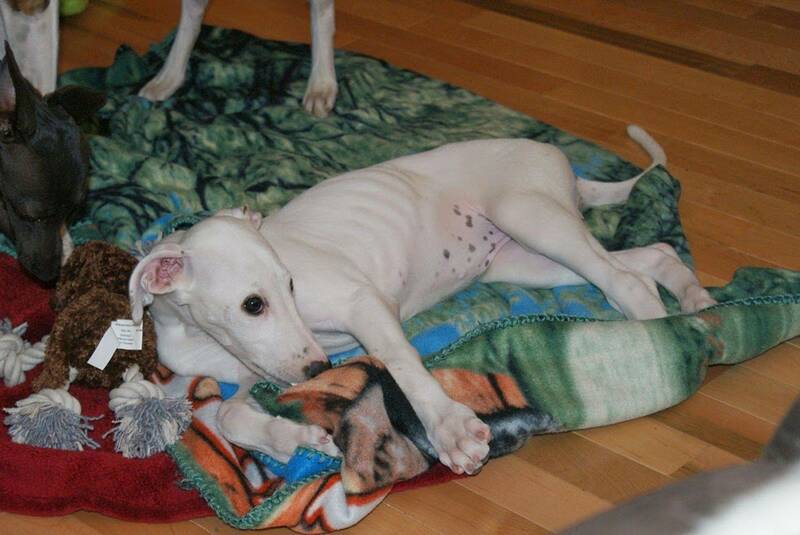 There is another amateur racing organization, the Whippet Racing Association (WRA) but it is for Whippets only. Lure coursing competitions are fun to watch, and designed to preserve and develop the skills that greyhounds and other sighthounds have been bred to have for thousands of years. The dogs run for the thrill of the chase and the occasional stuffy or dog treat. Their humans get ribbons and trophies and are excited about earning permanent titles for their dogs. No betting is allowed and there are no cash prizes, this is just for fun. 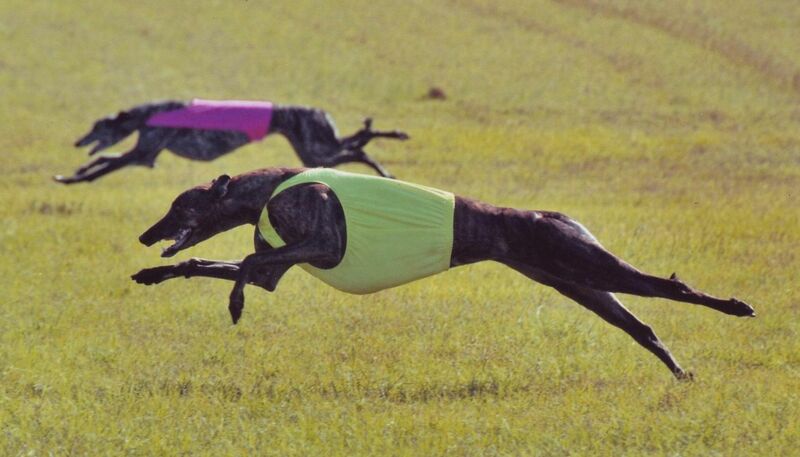 Coursing is a great way to keep your greyhound physically and mentally fit. Dogs must be at least one year old to compete. All pure bred sighthounds can enter as long as they don’t have breed disqualifications. Since greyhounds can come in any color and almost any size, if your greyhound looks like a pure bred greyhound you don’t have to worry about the breed disqualifications. For more information on the types of coursing see the summary of coursing organizations below or go to each organization’s website. AKC lure coursing: Coursing dogs are scored by judges on: speed, enthusiasm, agility, endurance, and their ability to follow the lure. Dogs run 2 courses that vary in distance from 600 to 1000 yards; the combined score of both courses determines the winner. Additional runs may be necessary in the case of ties and to decide Best Of Breed and Best in Field. Courses are run with up to 3 greyhounds running together. The dogs are hand slipped and released on the command “Tallyho”, not on lure movement. Dogs wear a colored coursing blanket in pink, blue or yellow and a quick release collar is used, racing muzzles are optional. The lure coursing Tests offer the Junior Courser (JC) and Senior Courser (SC) titles. In the Junior Courser test the dog runs solo and is required to run at least a 600 yard course with four turns under two different judges. For the Senior Courser test the dog must be eligible to run in the Open Stake by virtue of having a Junior Courser title; must run with at least one other dog and must earn a qualifying score at four AKC tests under at least two different judges. To earn the Master Courser test the dog must earn 25 qualifying scores in the Open, Open Veteran or Specials Stake and have a Senior Courser Title. ASFA lure coursing: ASFA is very similar to AKC coursing and is run with up to 3 dogs on a field. Like AKC coursing the lure runs through a series of pulleys that make it run in a pattern similar to that a rabbit would run. White plastic bags are used as lures. The hounds are judged on Enthusiasm, Follow, Speed, Agility and Endurance. Courses are usually 600 to 1000 yards. Dogs are hand slipped and are released on the command “Tallyho”, not on lure movement. They must wear blue, yellow or pink colored coursing jackets and a quick release collar is used, racing muzzles are optional. Dogs also run 2 courses with additional courses run in case of ties and to determine Best of Breed and Best in Field. Dogs start in Open competition and compete for the Field Champion (FCh) title. Once they are Field Champions they can then work on getting points toward their Lure Courser of Merit (LCM). 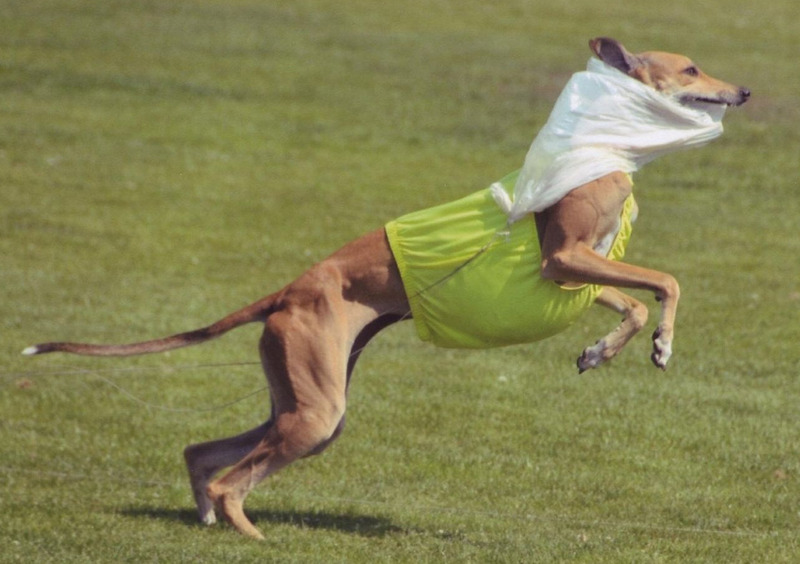 LGRA Racing: Hounds race 200 yards on a straight, flat track after a furry lure with a squawker inside sometimes a plastic bag is also attached.? They are graded according to previous racing experience or using the LGRA 'WAVE', a weighted average of the dog's last three race meets. There are three programs with heats made up of a maximum of four greyhounds. All dogs must run with properly fitted muzzles and numbered race blankets #1-4 in standard racing colors. Dogs are released from racing boxes or hand-slipped on lure movement, depending on the club and equipment available. Winning is based only on speed and who crosses the finish line first. Winners earn points towards the Gazehound Racing Champion title (12 GRC points). Once this title is achieved, the hound earns points towards the Superior Gazehound Racing Champion title (30 NRC points). NOTRA Racing:The track is an oval or horseshoe shape and varies between 220 and 440 meters. Dogs wear muzzles and numbered race blankets #1-4 and are released from racing boxes or hand-slipped on lure movement. This is a speed-based event with the fastest dog over three courses declared the winner. Up to 4 greyhounds may compete at a time together. Dogs compete for the Junior Oval Racer (JOR) title, the Senior Oval Racer (SOR), the Oval Racing Champion (ORC) and the Supreme Oval Racing Champion (SORC). What do I need for my Greyhound to compete in Lure Coursing? Paperwork: Request a Blue Pet Certificate from the National Greyhound Association. You will need to have your dogs racing name and/or ear tattoos when you make the request. The blue pet slip will come in the mail and will have your dog’s actual owner and his address on it. Follow the directions on the slip. After you get the slip signed be sure to make several copies of it to turn in at your first competitions. The dog is now officially yours and you can enter ASFA lure coursing and NOTRA and LGRA amateur racing. You can use the signed blue slip to request an official registration certificate from the NGA but that is not necessary for coursing. You will also need to call the NGA at 785-263-4660 and ask them for your dog’s Volume and Certificate numbers and be sure to memorize them or have them with you anytime you course or race your greyhound. The NGA will give them to you over the phone if you have your dog’s racing name and/or tattoo numbers. The only thing that you cannot enter with the signed blue slip is the AKC lure coursing. For that you need an AKC Indefinite Listing Privilege Number (ILP/PAL). Print out the form and follow the directions on it. You will need to send in a couple of photos of your dog and proof from your vet that it has been neutered or spayed and a registration fee. The AKC will send you an ILP number within a few weeks. The ILP makes your dog eligible for ALL types of coursing and amateur racing along with Agility, Obedience and many other types of competitions. The ILP can come in handy if you can’t read your greyhound’s tattoo numbers and don’t know it’s racing name or if it was never registered with the NGA for whatever reason. 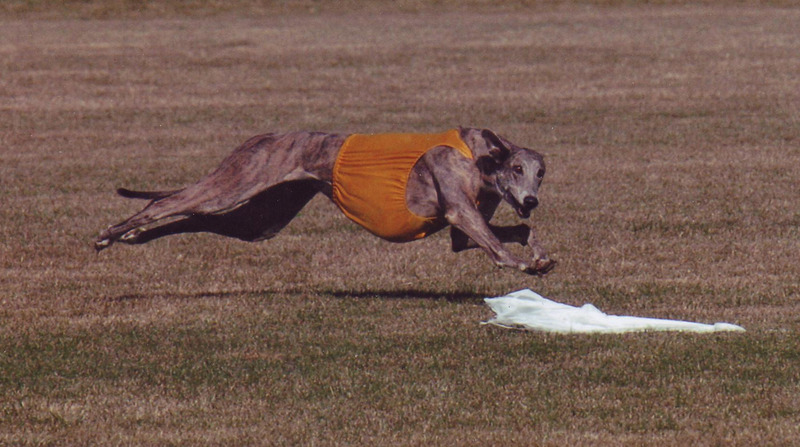 Your dog can still compete in all forms of lure coursing and amateur racing with the ILP number. You can get an ILP number for any greyhound that looks purebred even if you have NO information on its racing background or bloodline. Equipment:You will also need 4 racing jackets to compete in the NOTRA or LGRA racing. A red jacket with a white #1, a blue jacket with a white #2, a white jacket with a black #3 and a green jacket with a white #4. On some of the websites you may see a number #5 and #6 jacket mentioned, but this is only for whippets. Greyhounds run 4 dogs at a time so they don't need the #5 and #6 jackets. You can order real racing jackets and muzzles through Halemar, make them yourself or order online from another source. Racing Jackets should extend from the shoulder blades to beyond the last rib, be fitted neither too tightly nor too loosely so as not to restrict the stride nor flap in the wind. Numbers should be 4 inches tall. Usually there are other greyhound owners at competitions who will happily share their racing jackets with you when you first start out. For AKC and ASFA lure coursing you need 3 coursing jackets with no numbers in bright pink, yellow and blue. They can be made out of any type of material. Both types of jackets are often available for sale at competitions and can be ordered online. For ASFA and AKC lure coursing you will need a quick release lure coursing collar or a lure coursing slip lead. For NOTRA and LGRA the dogs are allowed to run in a thin, martingale or standard collar as long as the tags have been removed. GoCoursing.com most of the gear you need. Conditioning: Lure Coursing is not the same as a run in the back yard. Greyhounds put a hundred percent into coursing and an overweight dog that has been a couch potato for a year since he retired from racing should NOT course until he gets into shape. Take an honest look at your greyhound. Can you clearly see the outline of two or 3 ribs? Fat rolls do not count. Can you see the tips of his hip bones? Is he within 5lbs of his listed racing weight? You can usually find your dog's racing weight listed on Greyhound Data by putting in his registered racing name. If your dog is not as trim as he used to be, he needs to wait to compete until he has lost some weight. Your dog will loose weight with just a small decrease in food and the big increase in exercise necessary to get in shape for coursing. Your greyhound’s risk of injury is much higher if he is overweight even if he is just running in the back yard. If you aren’t sure if your greyhound is at a good weight for coursing, take him to a lure coursing event to watch and ask someone there. Coursing folks are an incredibly helpful group of people that will put the dogs welfare ahead of possibly offending someone. It is embarrassing to hear that your dog is too fat but many of us heard it when we first started coursing. In coursing your dog runs farther and more often than he did at the race track so you want him as thin as he was when he raced. A good “pet weight” is NOT a good coursing weight. Human sprinters are on the thin side and the same is true of dog sprinters. Be sure your dogs is healthy enough for hard exercise by starting with a trip to your vet for a check up. To get a greyhound into condition for coursing he needs to reach a full double suspension gallop 3 times a week. This isn't just a lope, but a hard fast run. If you don’t have a very large backyard you will need to take him to a fenced baseball field or a bigger field if you can find one. If your dog won’t run hard on his own, you may need two people and two favorite toys on ropes. Stand on opposite sides of the field and get him to run back and forth between you using the toys as lures. A long pole or a bull whip with a rope tied to it and a toy on the end also works great for exercising your dog in a smaller area. Some greyhounds will chase a ball or a Frisbee. Use whatever your dog likes to get him to run. Some owners jog with their greyhounds gradually increasing the distance until they can jog 2 miles per day. NOTE: Just walking 2 miles a day with your greyhound won’t get him into the shape he needs to be in. Remember greyhounds are very heat sensitive. An overweight, out of shape greyhounds should never be strenously exercised on a hot day. Exercise in the morning or evening only if it is hot outside and be sure to watch the dog closely and provide water often. Be careful not to over exercise. A greyhound can get the exercise he needs in 1 minute of hard running. Remember the muscle tone he had when he just retired from racing? He got that from racing only 30 seconds once every 3 to 5 days. When a greyhound is in top shape you should be able to see a stripe in the muscle across the rib cage from shoulder to flank. He should also have muscle visible on each side of the backbone. You should be able to clearly see quite a few vertebrae with thick layer of muscle raised a little on either side of the backbone. Of course, the shoulder and hind end should look very muscled. Start out slowly with walking instead of running if your dog is really out of shape and increase the time and distance gradually. Remember, some ASFA and AKC courses will be nearly 1000 yards (almost twice as far as your greyhound ran when he raced). Your dog will be expected to run that distance at least 2 times in a day during a competition. If he wins there will be at least a 3rd if not a 4th run. Usually there is another competition offered the following day. My greyhound has run up to 9 courses in the space of two days. It is always wise to take your dog to a vet for a checkup before starting a strenuous exercise program. The long courses and quick turns in ASFA and AKC coursing are ultimate tests of conditioning. Lure coursing clubs always check their courses to make sure they are as safe as possible but this is a strenuous sport and there is a risk of injury. It is just like the soccer or football that we let our children play, we know that accidents can happen. Our children enjoy the sport and the exercise is good for them so we let them play, it is the same with our dogs. By making sure your dog is in the best possible shape, you minimize his risk and increase his enjoyment. Trim nails: Make sure your dog’s nails are as short as you can get them. They should not touch the floor when the dog is standing. When a greyhound runs and turns at speed there is a lot of force put on those toe nails. If they are long he can end up with painful broken nails or possibly a broken toe. This is something you should do anyway if your greyhound runs around in your yard to minimize the risk of injury. Practice wrapping your dog’s legs: Many people wrap their dog’s legs to protect them from line burn and to keep the dewclaws from catching the line. In most LGRA and NOTRA racing events this is not necessary since the line is out in front of the dog at all times. Dogs do cross the line and run along it in ASFA and AKC lure coursing so many people choose to wrap. Some people extend the wrap down to cover the large pad on the base of each foot if the ground is rough or hard. Greyhounds can easily tear off pieces of this pad when turning or stopping quickly on a rough surface. You can get VetWrap at your local horse supply store. It is what is used to wrap horses legs with. How much should you buy? I can usually wrap 6 legs with each roll. Wrap the legs just tight enough for the wrap to stay on at a full gallop. Practice at home so your dog gets used to the wraps and you have a feeling for how tight to wrap them. You will want to take the wraps off after each run and re-wrap your dog’s legs just before his next run. Use wraps in black, tan and white only. 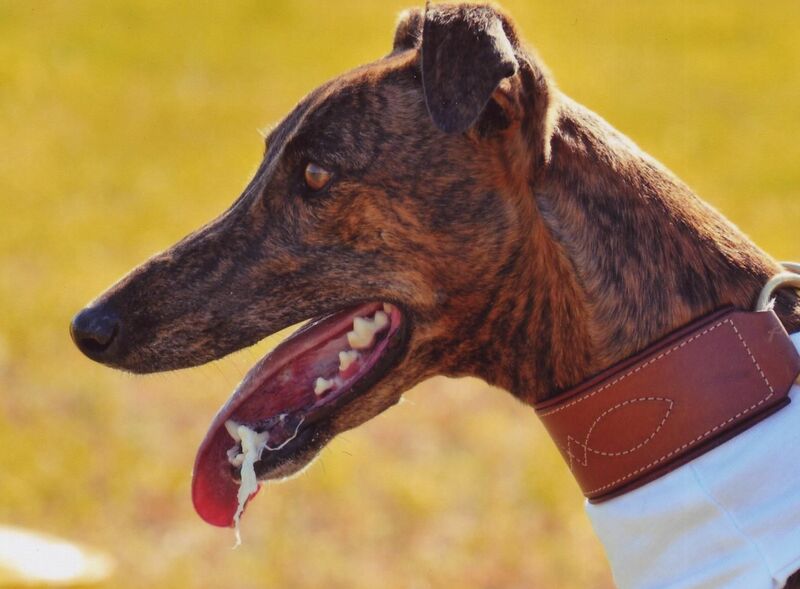 Other colors are available but it is against the rules to use wraps in the colors of the other dog's coursing or racing jackets so it is easier to just stick with black, tan or white rather than trying to remember which colors can be used for which type of event. When you go to your first coursing event look for another greyhound owner and ask them to show you how to wrap legs. Most are glad to help. ASFA: Your dog should run a practice alone, then runs with another dog in front of judges to be certified (a muzzle is not required but should be worn during certification out of respect for the other dog and owner – you can’t be sure that your dog won’t bite another dog over the lure until he has run several times). Both practice and certification can be done on the same day at a practice session. AKC: Your dog must complete two full courses running alone. They must each be run on separate days in front of two different judges. At that point your dog will get its’ Junior Courser (JC) title and be able to actually enter a competition with other greyhounds. NOTRA: Your dog will be asked to run one qualifying run in front of a judge with another dog before competing. LGRA: Your dog will be required to do a qualifying run before competition in front of a judge. Owners at the competitions usually have dogs that can run with yours for certification runs. It is usually better to do this rather than run two dogs from the same household together. Dogs that live together sometimes play and correct each other instead of focusing on the lure. All of the coursing/racing organizations above have a calendar of events on their websites. The official entry forms (called Premiums) are available online or can be requested by email. Arrive early and bring your entry form with you along with copies of your dog’s paperwork (NGA signed blue slip or AKC ILP, Volume and Certification numbers, and copy of your certification slip if you have already done a certification run). Registration with the coursing or racing organization can be taken care of when you get to the competition in the case of ASFA, NOTRA and LGRA and will only cost a couple of dollars. The field trial secretary will help you do this. For AKC coursing your dog has to be registered by obtaining an ILP number (see above on how to get one). Be On Time: When you are actually competing you will need to be there early for Roll Call (the time is listed on the Premium and is NOT the time the trial starts). At Roll Call dogs sign in and are jogged in front of an inspection committee to make sure they are sound. The females are wiped to make sure they are not in heat (yes, they will even wipe your spayed female). The individual courses are then drawn and posted and they will also post the order the breeds are running in. I won’t go into how to read what they post but you can ask anyone there to help you figure out when your dog runs and what color of jacket he should be in. If you are not there in time for Roll Call your dog won't be allowed to run. Pay Attention: It is your responsibility to have your dog to the starting line when he is supposed to compete. There won’t be a specific time listed. They will just post the running order so you will know that the Greyhounds compete after the Italian Greyhounds, for example. You have to watch carefully to make sure your dog is ready when his turn comes. They will run all the breeds once then start over and have the breeds run a second time in the same order. For LGRA and NOTRA the dogs all run a third run. Points may be deducted if you are late to the start line and hold up a course. Help: The LGRA racing events call for everyone to participate even when their dog is not running. Each dog needs a person to release it and someone else at the other end of the track to catch it. They also need many finish line judges and are pleased to show you what to do. NOTRA meets also ask for volunteers to be finish line judges. The ASFA and AKC meets are harder to judge so you won’t be asked to help until you are very familiar with the sport. Since the lure returns to its starting place the same person can release and catch the dogs in ASFA and AKC coursing. Plan to stay all day: If there are ties, there will be run offs before awards are handed out. In ASFA and AKC the winners will run again for Best of Breed (optional - you can choose to withdraw if your dog is too tired to run). The breed winners then run for Best in Field against the best of all the other breeds (also optional). For Best in Field the different breeds run together but are judged individually by how their breed typically runs. It would be impossible otherwise for a slower dog like a Wolfhound to ever win against a Greyhound. Best in Field is usually the top award and means that your dog ran better than any other dog, regardless of breed, in that day’s competition. Best in Event is even bigger and that is only offered at some trials. That award goes to the dog that ran the best in two days of competition. Ribbons, trophies and sometimes toys for the dogs are given out after the competition is over and the points have been posted. Each organization has rules on colors of ribbons and if they must be given out at all. Any additional prizes and trophies are up to the individual clubs. Usually the Best in Field or Event means you get a trophy, sometimes there are Best of Breed prizes too. Sometimes all ribbon winners get to pick a dog toy. By the time the ribbons are handed out it is often starting to get dark. 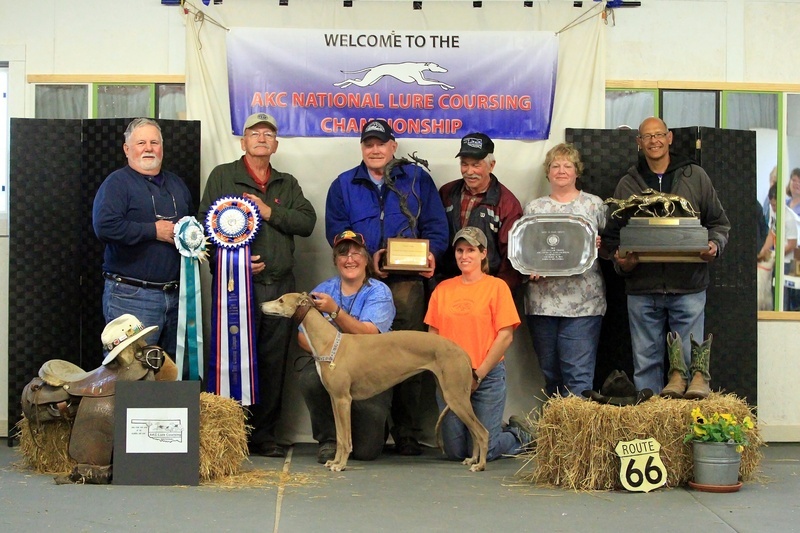 One of the biggest wins in American Lure Coursing is to win the AKC Lure Coursing Championship and the title of National Lure Coursing Champion by winning Best In Field over all. 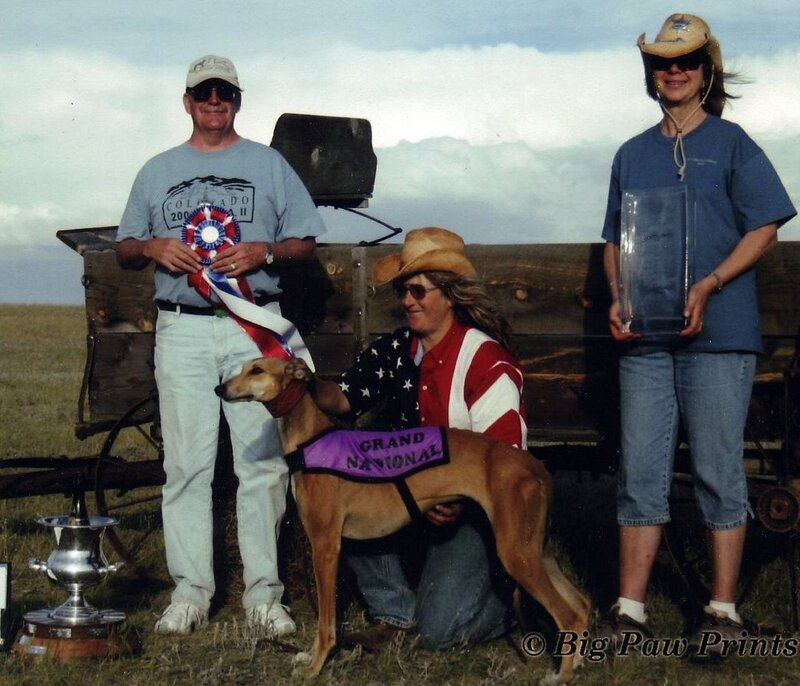 This Greyhound, our "Amazing Amber" official name and titles-- MBIF NFC FC Windrock Candle In The Wind LCX LCM was crowned the National Field Trial Champion for 2006. 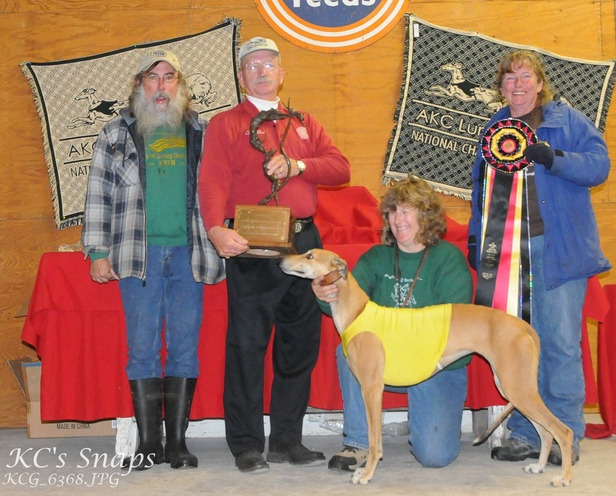 In 2013, the AKC National Field Trial Champion was another greyhound, also bred and owned by WINDROCK. Our golden girl"Nikki" --MBIF DC Windrock DM The One And Only SC Fch defeated her opposition by more than 6 points for Best In Field honors! 1 quick release/slip collar (ASFA and AKC only, optional for LGRA and NOTRA). In LGRA and NOTRA you may run your dog in a regular thin martingale collar with tags removed. Wide decorative martingales should NOT be used! Strong Collar and leash and an extra set. Greyhounds have been known to break their collars and leashes in excitement. If your dog will run in his collar be sure it is a thinner martingale with tags removed (LGRA and NOTRA). Water bowl and water – Some fields have access to water but some do not. Drinks and lunch for you - Some events serve lunch and some do not. 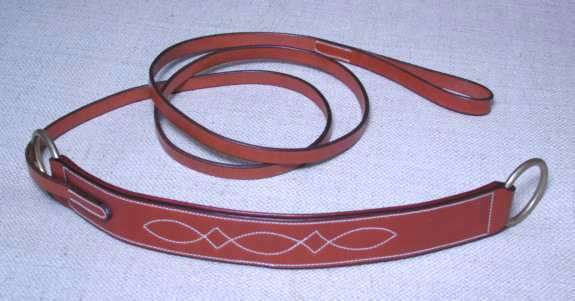 This is a beautiful leather slip lead. This will last many years with proper care. Nylon webbing ones are popular, but the nylon can inflict painful burns and cuts. Thanks for the memories and the thrilling runs-- we will never forget. This is the first BIF won by our Naughty who was primarily a working varmint dog. She loved the plastic game and went on and enjoyed a thrilling career until a work related injury forced her retirement. The II or International Invitational is the premier event in ASFA coursing. 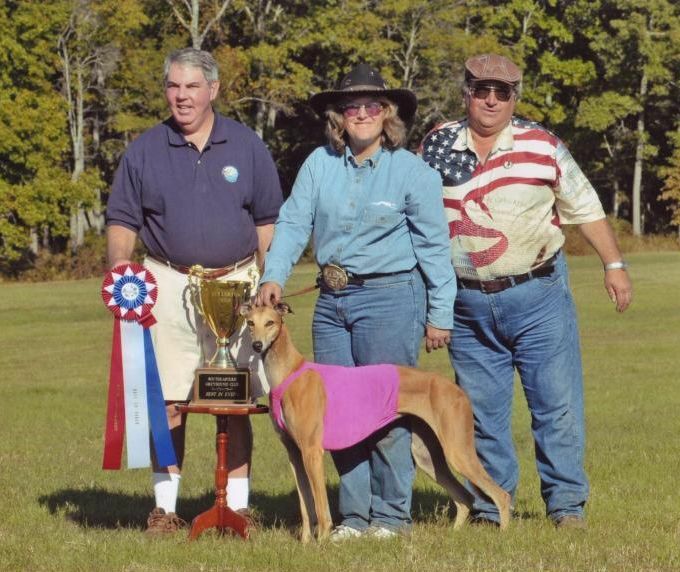 WINDROCK coursers have done very well in this lofty competition over the years. Here, as in many times hence, our greyhounds won both the Open and Field Champion Stake honors. BOB winning Tipsey was ONE point behind the overall BIF winner that year! Both of these wonderful coursers are long gone now, but what wonderful times and memories shared. The Grand National~the toughest lure coursing event in the country! A big win for Amber over 125 sighthounds!